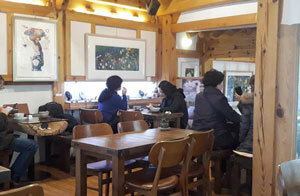 The tea house was designed by its owner Kim Ji Seon, a friendly woman who said she wanted to create a place where people could relax and rejuvenate. The wooden tea tables and pottery lining the walls gives it an air of rustic elegance. It was very relaxing sipping on tea as I looked out the windows. And that’s just what the owner wants. There were a few foreigners enjoying those drinks the day I visited. Everyone seemed to be enjoying their tea and conversations. As for me, I chose Jujube Ginger Tea (7,500 won), hoping for the same taste of the tea my mother made me during the winter when I was a child. This tea is known to contain a lot of ingredients to help you sleep. (If you have trouble sleeping at night, try this one!) 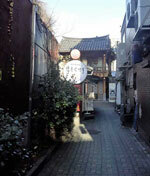 All drinks are in the 7,000-8,000 won range, just like other tea house in the area. The tea house also hosts occasional cultural events.